So many “something blues” in this winter wedding theme! COLORS: Wintery blues and silver. Let the winter season be your guide in choosing the right blues and silver. 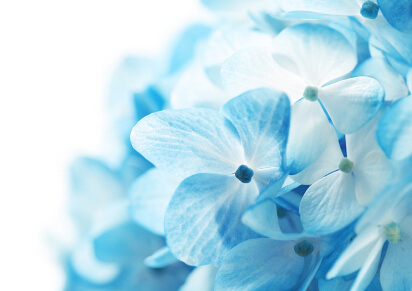 FLOWERS: Hydrangeas in white & various shades of blue. Your bouquet can include white and light blue flowers while your bridesmaids’ bouquets incorporate darker blue flowers. ATTIRE: A shiny, satin gown with light blue trim or a light blue sash and long, satin gloves. Dress up your groom’s traditional tux with a light blue tie and vest. Have your bridesmaids all wear various shades of frosty blues. A super cute idea would be for you and your bridesmaids to all have small fur coats to sport around after the ceremony. LOCATION: A cabin, church, or antebellum home. You definitely want to have an indoor ceremony & reception for this theme. Even if the weather in your state in bearable, you want your guests to feel cozy. Have a fire going during the reception if possible. CAKE: White cake with light blue accents. Adding snowflakes would be a nice touch. MENU: Warm, holiday foods. Have a soup bar instead of salad bar. Serve honey-baked ham, roasted potatoes, and a vegetable medley with warm dinner rolls. As a special treat, offer hot cocoa with dessert. OTHER IDEAS: AmericanBridal.com has clear jewels to spread on the table that resemble icicles. They also have frosty blue-colored candle wedding favors that would be perfect for this theme.